Thaicom Public Company Limited has signed an agreement with iSAT Africa Ltd FZC. (iSAT) — a leading African telecommunications provider and a subsidiary of Wananchi Group Holdings — to provide iSAT’s key customer in East Africa with fully managed satellite telecommunications services, including satellite backup of their fiber network. Under the agreement, Thaicom will provide Internet Protocol (IP) connectivity via the THAICOM 6 satellite in the case of fiber network outages. The full-time, managed service will enable iSAT Africa to provide their client with a fully redundant and highly available backup solution for the provision of uninterrupted broadband services. The managed iInternet backbone and related services provided by Thaicom are based on a point-to-point satellite link between Thaicom’s designated teleport and the customer’s remote site, thereby providing uninterrupted access to the network. 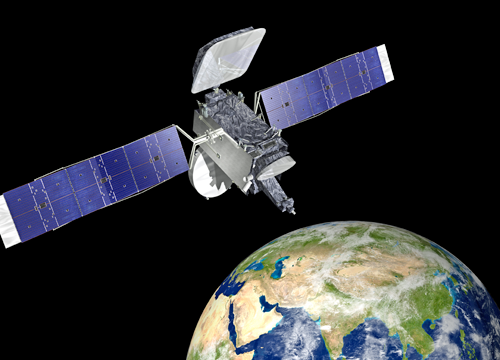 Artistic rendition of the Thaicom-6 satellite on orbit. According to Patompob (Nile) Suwansiri, Chief Commercial Officer with Thaicom, his company has experienced an increase in the need for reliable and cost-effective satellite communications in Africa. Therefore, Thaicom intends to continue their reach and to provide their clients with the best possible solution for their business requirements. Thaicom has many years of experience in providing leading telecom operators across Asia with premium cellular and internet backhaul and African customers can now benefit from this experience as the firm provides managed network backhaul services, as well. Munish Sharma, the COO of iSAT Africa, his firm is at the forefront of innovation, while offering flexible managed services across Africa and other parts of the world in the field of VSAT, broadcasting, voice, GSM backhaul and fiber. Data demand throughout the world is being driven by the increased popularity of connected devices—and Africa is going in the same direction. Satellite services are playing a key role in the development. Satellite is ideal to extend iSAT’s fiber network via Internet Protocol in Africa to places that are not connected to terrestrial networks. iSAT’s fiber networks cover Africa, Europe, Asia and America. This collaboration with Thaicom will assist in fulfilling the growing demand for connected devices as well as offer data services by way of a resilient fiber network, all the while maintaining high QoS standards.